Gong-fu Cha ceremony will need a big enough space to accommodate a table suitable to hold the number of utensils required. The allotted space should also be peaceful and calming and this kind of ambiance is created with incense, flowers , music and even songbirds. 1. Preparation of the water. This is a very important procedure. Water is boiled and placed in a small stove to retain the temperature at desired level. Water is used to fill the pot for brewing completely, and then its lid is put in place. Water is poured on the pot’s exterior to speed up heating time. Water that is almost boiling must be used to wash the tea wares to make sure that each item is of the same temperature. After that, the pot is filled with the water and is used to keep utensils warm and remove dust. 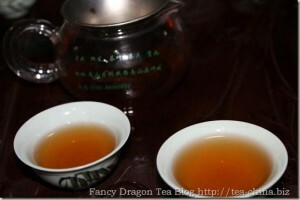 The tea should be put in the lidded pot (gai wan). These pots are available in several sizes for instance 7 grams, 8 grams, 9 grams and 10 grams which a determine how much of the tea leaves to use. The usual pot used is 7 gram and 10 gram gai wans. 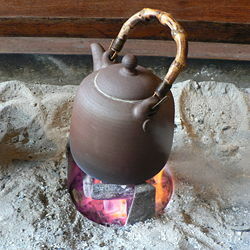 A teapot is warmed and hot water prepared at around 212 F where the tea leaves are to be put. Do not use boiling water as it may cause damage to the tea leaves and its flavour. Different teas need different temperatures and amounts of water so it is important to know these rules to bring out the best flavours in your tea. 2. Measurement of the tea and placing in the brewing pot filled with water. The water is replaced immediately . This step is repeated to remove any unpleasant taste or flavour. The amount of tea leaves is determined and put into the brewing pot which is then re-filled with water . The water once more is replaced and the above process is repeated. This is to remove any unpleasant taste. 3. The infusion of the wonderful aroma. After rinsing the leaves, the first brewing begins. The brewing pot is completely filled with water. The extra foam and leaves are removed with the lid prior to replacing back in the pot . Hot water is used on the pot’s top. During pouring of the water, you should hold the kettle high above in order for the leaves to infuse completely with the water inside the gai wan. This will quicken the infusion by dissolution of the leaves with the water. Bubbles may appear on the water’s surface. If this happens, you may skim it using the lid. Collected bubbles on the lid can then be washed using the kettle. 4. Infusion of the wonderful flavour. Brew the tea for a minute then pour into the pot for serving. 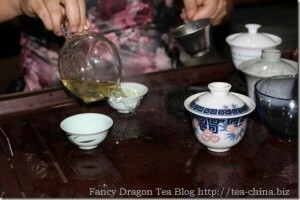 This step is later done in reverse so that the tea is in the wide cup and given to every guest. The guest partakes of the tea from the “heaven” cup and slowly smells the tea’s wonderful scent, keeping one’s senses focused on the tea’s attributes and appreciating the tea’s colour from infusion before finally tasting it from the wide cup. Drinking the tea is done with small sips. o The next brewings follow the same steps. 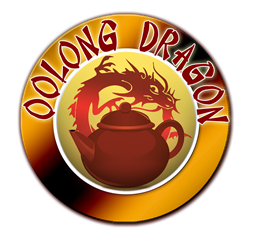 High-quality Oolong tea can be re-used as much as 5 or 6 times, with subsequent brewing better than the first. o The 2nd round of infusion is considered as the real infusion. When doing the second & third infusions of the Oolong such as Tie Guan Yin, the water must be allowed to soak in the tea leaves for about 10 to 15 seconds prior to straining. o The 4th & 5th round of infusions will take about 20 seconds whereas the 6th and 7th infusions may take longer at 60 seconds. o After this round of infusions, the tea is considered exhausted or spent although in some places people may still continue to use them for brewing. In case the leaves are still re-used, the leaves are usually immersed in water for at least 2 minutes. 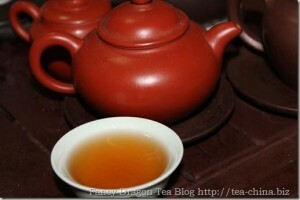 When brewing Pur-eh or Long Jing Green Tea, the brewing time may change. o The length of brewing can also be affected by other considerations such as the tea’s quality, the water’s quality and altitude. 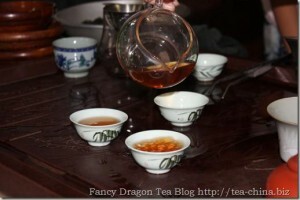 V. Quality Of The Tea: Which tea using for the Gong Fu Cha ?